1. Pick up one fully boiled crawfish. 2. Twist off its tail. 3. Peel off a bit of shell towards the front of the tail. 4. Pinch the back of the tail shell till the meat is squeezed out. 8. Repeat steps one through seven until you wave the flag of surrender (or your mound of discarded shells topples over). 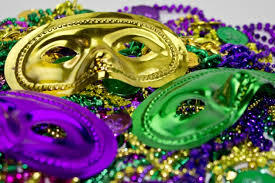 Mardi Gras masks and beads in traditional colors of green, gold and purple. But when you say “Thanks for the crawfish!” in Louisiana, be sure to pronounce it “crawfish,” not “crayfish.” “Crawdads” is also acceptable. Or so I was told. All I know for sure is, they’re delicious, however you pronounce their name. By the way, none of this new knowledge helped me master the Cajun two step, a deceptively difficult dance favored by many Louisianans, much to my bewilderment. Mix 3/4 cup mayonnaise with about four tsp. mustard (combo of Dijon and whole grain is good), 2 tsp. capers or chopped celery, 1 tsp. tarragon vinegar, 1/4 tsp. (or to taste) Tabasco sauce, one thinly sliced scallion, some chopped flat leaf parsley, salt and pepper to taste. Mix ingredients together and refrigerate for a while to meld flavors. 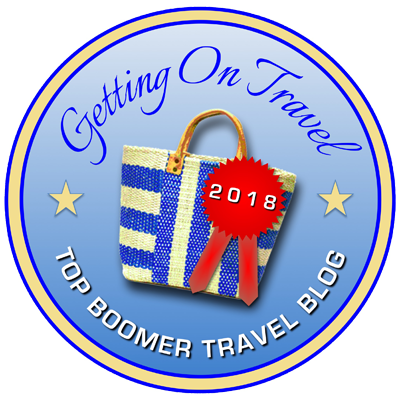 Travel Tip of the Day: People in Sweden are also crazy for crawfish, mostly imported frozen since Swedish crawfish are now quite rare, but that annual tradition usually happens in August, not at Mardi Gras time. The madcap Swedes like to throw crawfish parties, and if you’re invited to one, wear a silly hat for the occasion; you’ll fit right in. But when you’re there, call them “crayfish,” or, in Swedish, kräfta.